The NRA is trying to gut our gun laws -- putting our communities and our families at risk. Right now, they're pushing an extremely dangerous policy they call "concealed carry reciprocity" that would force your state to abide by the weakest gun laws in the nation -- and there's nothing your state will be able to do about it. 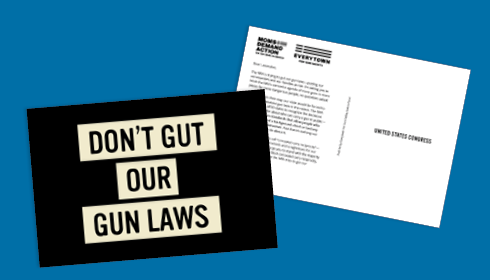 Use this form to flood Congress's mailbox with a clear, resounding message: Don't gut our gun laws. Protect public safety. The NRA is trying to gut our gun laws -- putting our communities and our families at risk. I'm asking you to block the NRA's extremist agenda of more guns in more places for more dangerous people, no questions asked. If the NRA gets their way, our state would be forced to abide by the weakest gun laws in the nation. The NRA wants to force all 50 states to recognize the decisions other states make about who can carry a gun in public -- even rock-bottom standards that allow people who have never passed a background check or had any safety training whatsoever. And there's nothing our state will be able to do about it. This policy -- what they call "concealed carry reciprocity" -- is a dream for gun extremists and a nightmare for our state's public safety. I urge you to stand with the majority of the American people, block concealed carry reciprocity, and fight back every time the NRA tries to gut our gun laws.